Witches, and Goblins, and Elves....OH MY!! lol. Do I look like the wicked queen? That's the look I was going for. Role Playing is a popular activity in Second Life, and I have been convinced to give it another try. I think we've established that I can't seem to stay in character, but my friends are very forgiving and have actually written my lapses into the modern world into my story line. Above, you see a portrait of Tessa, Lady of Phantasia, in my tower at Kingdom Phantasia. Born a princess and adored by my father, the King, I followed the footsteps of my mother to become a time-traveling sorceress--just can't help it, it's in the blood. Thus, you never know how you will find me dressed, my speech patterns are at times odd, and there are also some interesting...technologies, music, and such to be found at Kingdom Phantasia. I am sister to the recently widowed King, my brother Tucker, and have, due to my caring nature, stepped in as the Lady of the Kingdom--muahahahaha. (My neice, Celeste, the Princess Royal, would have me insert here that I am a "good" sorceress and just hamming it up for All Hallow's Eve. And it's true.) None-the-less, Tucker has commanded me to keep my "activities" in my tower at Kingdom Phantasia, and he's assigned a Driad, whose name changes daily (hear that Rase? ), to keep me out of trouble. LOL. Above, I am wearing a couple of beautiful dresses from the vintage room at Evie's Closet. (I love Evie's Closet--thanks Evie!) And I have on new jewelry from ELEMENTAL JEWELRY--The Dark Aurora Necklace & Earrings. Below, you will see the Light Aurora set. Each set is texture changing, with 4 aurora borealis textures on the faceted gems, and 4 semi-precious stone textures on the beads. The metal changes between silver and gold. You can also play with the shine, glow, full bright, and transparency for lots of different effects. The crown is part of the Crown Jewels of Phantasia set, which is not yet available but soon will be. Jewelry: ELEMENTAL JEWELRY--Dark and Light Aurora Necklace & Earrings. Texture changing. 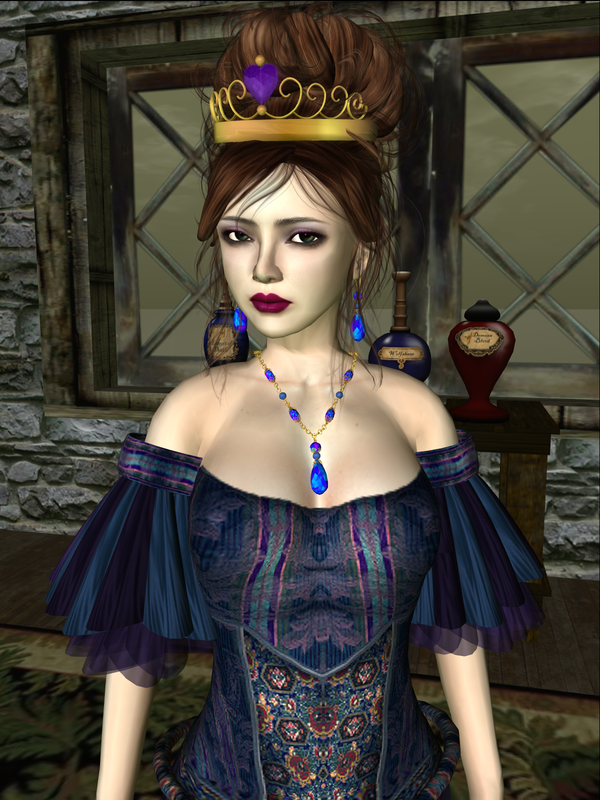 Purple Dress: Evie's Closet--Romany Kiss in blue. Purchased full price. Red/Black Dress: Evie's Closet--Aurora in black/red. Purchased full price. Blue Dress: Swansong--Mirage dress in Ice. Purchased full price. Skin--Curio--Top 2 photos--Jewel Gold Tones. Bottom photo--Pout 2. All purchased full price.